El Día de los Muertos (The Day of the Dead), celebrated in Mexico on November 1st and 2nd is a ritual rooted in indigenous beliefs of an afterlife and in a belief that death is simply a continuance of life on another plane of existence – nothing to be feared but, rather, something to be celebrated. 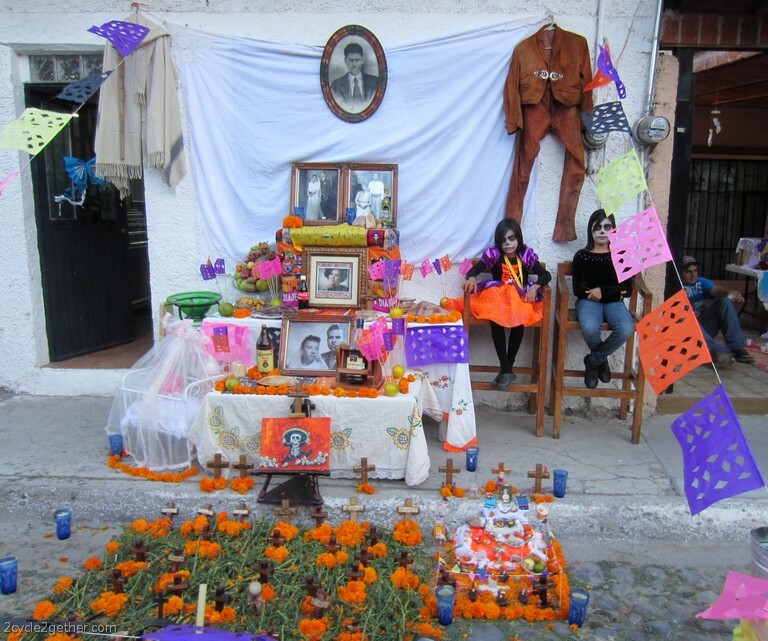 Each year families and communities gather to remember their loved ones who have passed by creating elaborate altars inside their homes to honor their relatives. 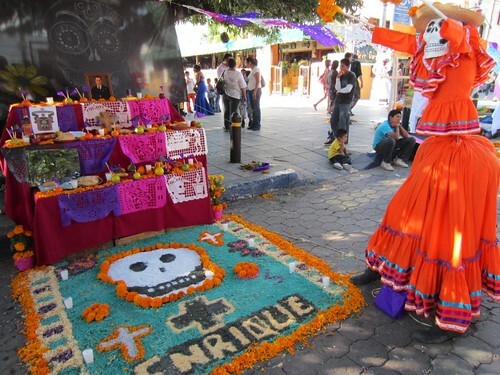 These altars are set up on tables covered with colorful tablecloths and papel picado (“perforated paper” – a decorative craft made out of paper cut into elaborate designs) and are often decorated with sugar skulls, candles, margigolds and paper mache skeletons. Plates of favorite foods and drinks of the relative are placed around the alter, along with clothes and/or items that represent the deceased’s occupation or hobbies or, if a child, their toys. “La Catrina”, also known as death. 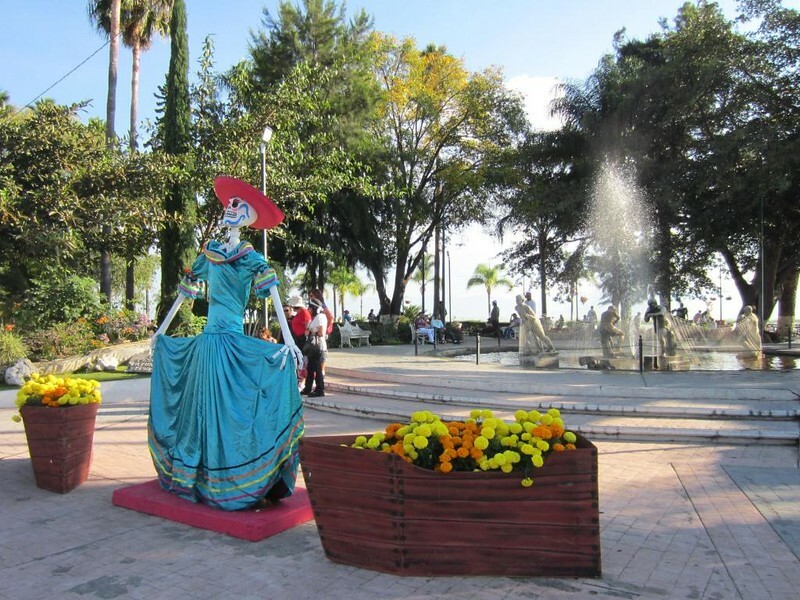 Catrinas, in different costumes, line the streets of Chapala for Day of the Dead. On November 1st, the ritual to honor the Angelitos (little angels – children that have died) begins early in the morning and you can hear church bells ringing in pueblas as early as 6 a.m., calling the souls of the departed and their living relatives to begin the ceremonies. Families gather at the cemeteries throughout the morning to clean the grave sites of their loved ones. They decorate the tombs similarly to the the altars in their homes, covering them with flowers, bread, fruits, and gifts they’ve made. Candles and incense are lit, to help guide their relatives souls back to visit with them. The next morning, on November 2nd, the ritual to honor deceased adults begins. Throughout the day and in to the evening, cemeteries are filled with people coming to honor their relatives, to clean sites and to decorate the gravestones. They spend the day sitting around the gravestones, often sharing the favorite foods and beverages of the beloved deceased. 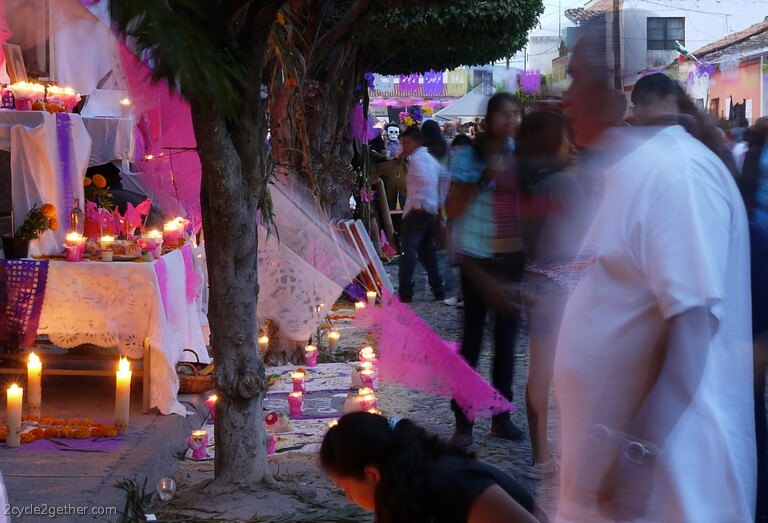 The Day of the Dead is not a sad or quiet ritual. Throughout the day children run around playing, laughing and eating. Vendors set up in front of cemetery entrances, selling flowers and a variety of foods and drink. And the sound of music is everywhere as bands play to honor the dead. Children with faces painted and playing music around a family altar, Day of the Dead. 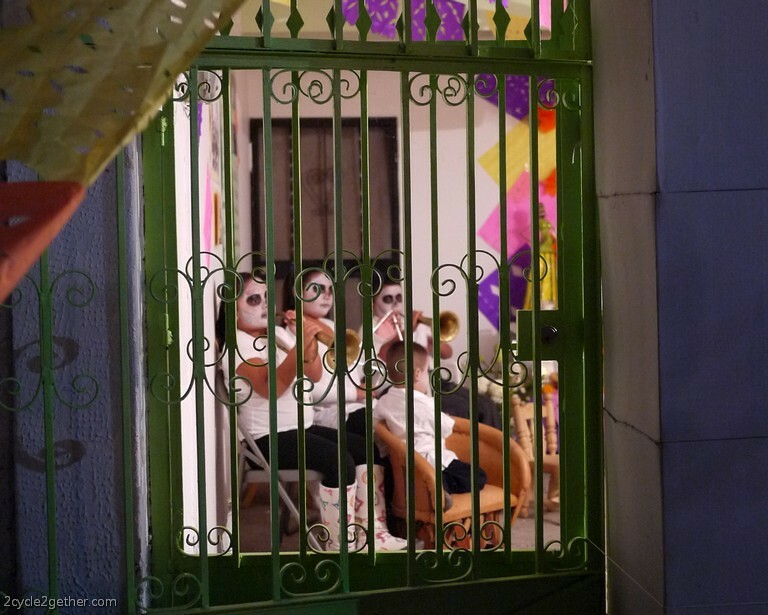 Check out our video below f the Day of the Dead celebrations in and around Chapala and Ajijc and find more photos on our Flickr site. El Día de los Muertos :: Day of the Dead from 2 cycle 2gether on Vimeo. Hey Sheila! So glad you wrote this piece. I was in Mexico for this several years ago and I couldn’t remember what it was called. We had a blast that day and indeed, everyone was happy and celebrating. I hope we get to do it with the whole family one day. Take care. So good to hear from you Brad! Will have to catch up with what you’ve been doing via your blog (awesome!). Fuerte Abrazos a Usted y su familia (Strong Hugs to you and your family).